Hi there, stamping friends! I am SO sorry I have not been posting on my blog this past week. If you have been following me, you know I am in the process of recovering from bi-lateral foot surgery. Trust me, I am SUPER tired of talking about it...but last week was not conducive to "creating" for me. I had a Dr. appointment on Friday and the good news is, after another month of recovery (YUCK! ), I will be better then new to ring in the month of October. Hooray! Thanks for hanging in there with me! I have LOTS of bloggy news coming up, so please stay tuned. But you didn't come her to hear about feet, did you? So, let's get to some crafty goodness! 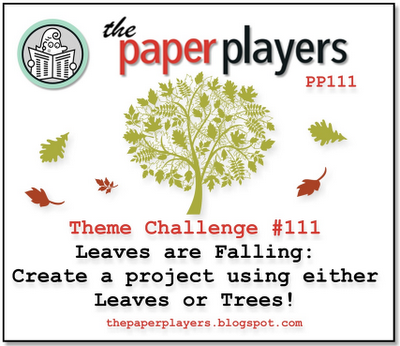 It's Sunday, so it is time for another fun challenge over at the Paper Players. This week, Jaydee is our fabulous hostess with a great theme challenge. Fall is almost here...well, maybe anywhere BUT South Texas, where it is still 100 degrees...and we are featuring projects with leaves or trees. For my project, I attempted an autumn-themed card. 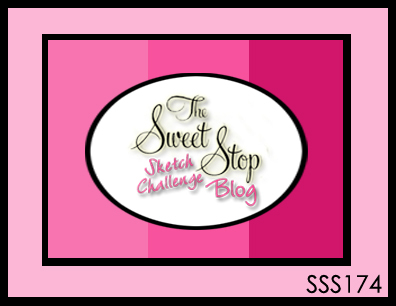 I got some inspiration from the awesome sketch from the Sweet Stop challenge. To be honest, this is the first time EVER I have inked up the Lovely as a Tree stamp set. Yes, I have had it for a really long time...I just never used the set. For this card, I dusted off my Watercolor Pencils and Blender Pens and attempted to create a fall-ish scene. I'm not claiming to be an expert in the world of watercoloring but I really like how it turned out. One of the things I miss a LOT, are the changing seasons back in Upstate New York, where I am originally from. The leaves do not turn here in Texas so I tried to recreate what I consider "Fall" to be on my card. I roughed up the edges of my card and added a lot of sponged ink. 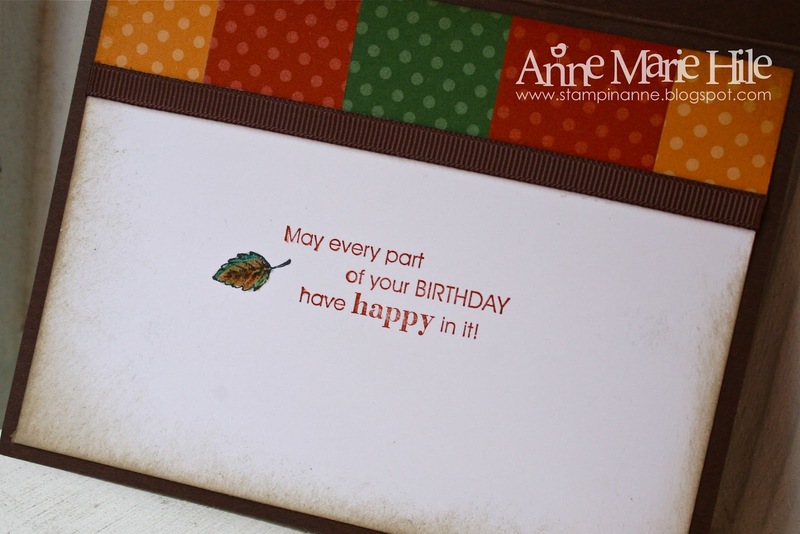 The Woodgrain Embossing Folder was added to compliment the main image. After the card was finished, I decided to add those brads to the corners. Thankfully, I did not destroy the card in the process. Yikes! All of the supplies used are listed at the end of the post. I really hope you will join us and play along this week at the Paper Players! Please be sure to check out what the rest of the Design Team have whipped up this week for inspiration. The challenge closes on Friday, September 7, 2012 at Noon (PDT). This is gorgeous, Anne Marie. The colors are fantastic and your layout too. Love the embossed background ! ack! This is GORGEOUS! You nailed that watercolouring!!! Your tree turned out amazingly! Wow!!! Glad to hear that you are on the road to recovery and in a month you'll be better than ever!!! yeah! Leaves don't really change to pretty colours here either...it just gets cold quick and they turn brown and fall off....lol....wish we had all those Autumn colours here too! Love your colors on the card! They are bright and fun! Great card! Can't believe it is almost that time of year again! I love this AM! You did a beautiful job with the tree and spot on with the sketch. Love your addition of the twine and button--the perfect rustic touch. I feel the same way you do about fall--it's the thing I miss most from my home state (Michigan). Thank you for capturing that feeling and sending it to us in the South! Glad to hear a good report from the doc--hang in there friend! BIG ((hugs))! Love the rich autumnal colours you've used Anne Marie! I can't believe this is your first ard with Lovely as a Tree..! That's my go-to set for trees and I had to convince myself to use something else for this challenge lol! 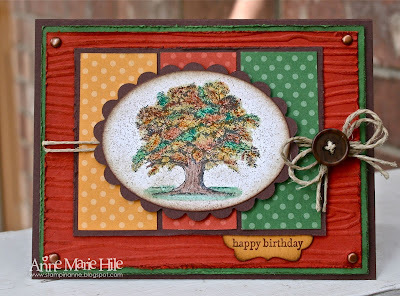 I love how you've done the twine and button - the perfect rustic accent for an autumnal card! Glad to hear yo'ure on the mend! Anne Marie your tree is Lovely. Your watercoloring is like looking out my window here in MI. I really like the multi colored squares inside too, and I can't believe you never used this set. This is one of my all time favorites that took me forever to get. I drooled everytime I saw a card with this set and finally purcased it 2 years ago.. and so glad I did. It's one of those Go-To sets. You certainly did this image justice Anne Marie. Your coloring is beautiful. This New Yorker loves the fall here in the Hudson Valley; the colors can be truly amazing. Glad your feet are progressing, LOL! And your tree is lovely---you need to ink it up more often! I noticed that you were missing and I was hoping everything was going okay with your feet. I'm glad your recovery is moving along! Your card is very pretty! Nice job with watercoloring!! It reminds me of the true splendor of the fall leaves!! And that reminds me of my mom! Fall was her favorite time of year. This card is SO pretty!!! I LOVE LOVE LOVE the feel of Fall!!!!! All the detail on this is gorgeous!!! And the border on the inside with the simple leaf...STUNNING!!!! I love this card. The tree is absolutely beautiful! Beautiful color and texture, Anne! 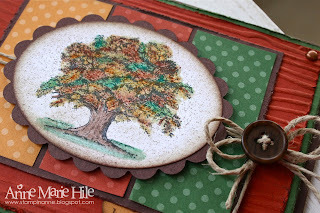 Love the way you colored that autumn tree...gorgeous! I can't wait until the trees outside look like this! Thanks so much for joining us at The Sweet Stop this week! Beautiful! The tree bark texture is the perfect background for your wonderful fall tree, and the twine and button finish this off perfectly! So glad your mending is going well and you will be 'back on your feet' in no time-pun intended!! What a gorgeous card Anne Marie. That tree looks amazing with the pretty colors. Great textures with the embossed background and twine. Thank you for playing along with us at The Sweet Stop this week. 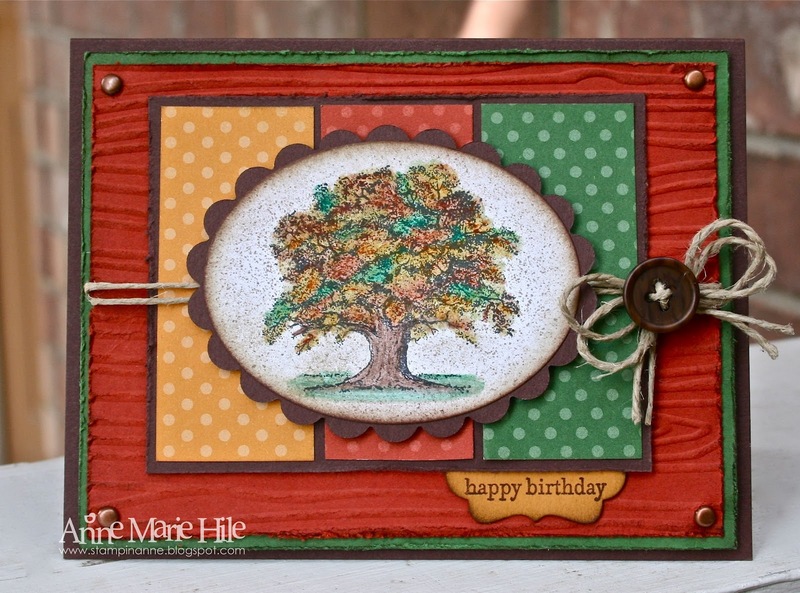 The rich colors of the DSP and embossed background make for a perfect Fall card. Beautiful watercoloring! Very pretty card. I like your bold choice of colors, and the way you did the tree. Looks like the one in my front yard. Oh this card is amazingly beautiful. Those colours take my breath away - such an inspiration. Beautiful card Anne Marie, I love those colours! You card is amazing, as always! I totally love your blog and creative style. Beautiful, Anne Marie! I LOVE the rich colors and the texture! I love your card it so pretty THANK YOU for playing along in the Sweet Stop Sketch! Please join us again this coming week! Have a great day! AM - terrific coloring job! I love the aged look to your focal point. The colors are fabulous. All round, gorgeous card!